During a break from repairing its altar cloths, I took a look around St Mary’s Cathedral, Limerick, and noticed a few dedications to ‘Raj’ people on the walls. One that caught my attention was of the Gabbetts – father and son. The Gabbett family had a comfortable life in Castle Lake, County Clare. Thomas Gabbett was one-time Mayor of Limerick and had seven children with his wife, Margaret. Their third child, John, was born in 1780 and joined the 88th Regiment of the Connaught Rangers. In 1810, John married Frances Hallam. The 88th was deployed to Bombay, Madras and Ceylon between 1796 and 1801. They were also running around India during the Mutiny of 1857 (and later, indulging in a well-documented mutiny of their own), but I doubt if John served in India. This is about their son, Thomas, who was born in 1830 – one of 12 children. He was only 13 when his father died. Young Gabbett joined the army and went to India. The very day after he reported to the 61st Regiment of Foot (South Gloucestershire), he was thrown in at the Sikh end . . . in the Punjab Campaign of 1848-49. The 61st fought its way through the province, demolishing forts and clashing swords with kirpans until Punjab was annexed. Gabbett was awarded a medal for Goojerat (Gujerat) and continued to march with the 61st on to Peshawar and into the Khyber Pass to quell the unrest that had been simmering in the Northwest. The regiment was based in Ferozpore when it received news that the sepoys in Meerut were up to no good. The 61st secured its arsenal and herded British families into barracks as mutineers set fire to the cantonment. While the majority of rebels headed for Delhi, the few taken prisoner were punished. The 61st turned out in full force to watch them being blown apart from canons. 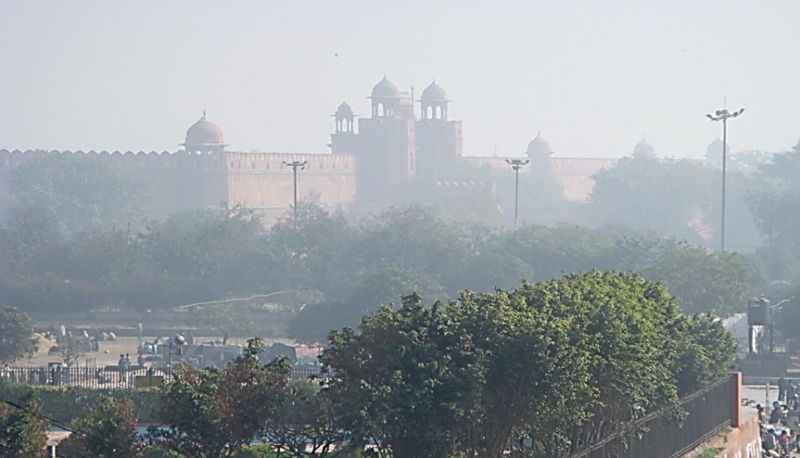 Having had its sport for the day, the regiment set out for the 250 or so miles to Delhi. Gabbett’s column was headed by Brigadier William Jones, who had also led in Goojerat. For the next four weeks, Gabbett threw himself into the frenzy with gusto – scaling the walls and blasting the gates of the city in the first of the storming parties to reach the entrenchment. Then his luck ran out. 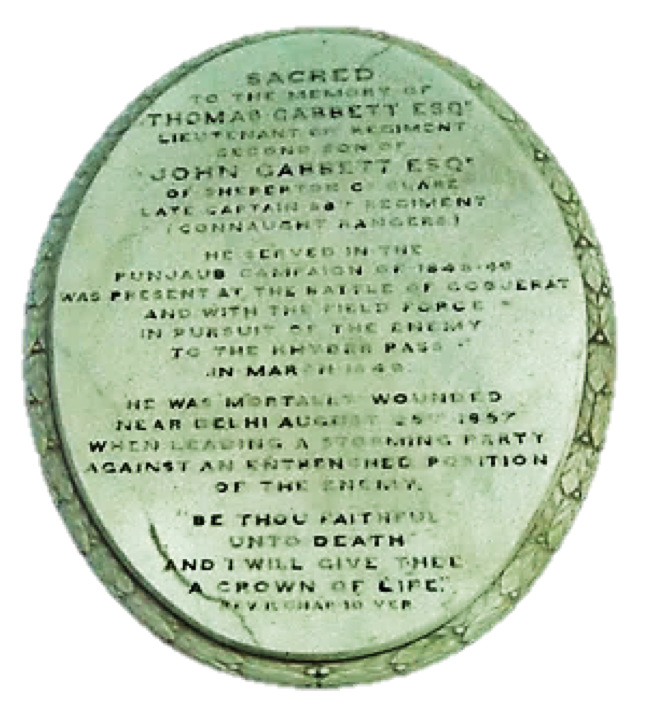 During the Battle of Najafgarh, Gabbett was in the process of capturing an enemy gun, when a bayonet was thrust into his left breast. He haemorrhaged internally for nearly a fortnight, before succumbing to his wounds on the 25th of August 1857. He was only 27. Two months later, The Limerick Chronicle carried a short piece on the death of a ‘promising youth [who] would have obtained his Company in a very short time.’ Another source claimed that ‘the General’ would have recommended Gabbett for a Victoria Cross ‘had he survived the action’. While his bones may lie in Rajpura Cemetery, Delhi, he will always be remembered in his hometown of Limerick. Since the ‘Gabbett Family Book’ details the family history, and to which I am grateful for a lot of information, I have decided to digress from the Gabbetts and write about another interesting character mentioned in the above biography. Brigadier William Jones, who wrote to Gabbett’s mother, was a hero in his own right. The Welshman was born in Kent to William Jones of Glen Helen, Caernarvonshire in 1808. He trained at Sandhurst Military Academy and enlisted in the 61st Regiment of Foot in April 1825 as Ensign without Purchase. After service in Ceylon, he began his Indian tour in 1845. He fought in three battles of the Punjab Campaign of 1848-49 and won the obligatory medals. After the Anglo-Sikh wars he led his regiment to the North-West Frontier for skirmishes in the Khyber Pass. Having routed the enemy, he was awarded a medal with clasps and made a Companion of the Bath. He seems to have taken a break in 1850 and gone home to live in Kilmore House, Limerick. It was owned by John Tuthill and around this time, Jones may have married John’s second daughter, Elizabeth Dorothea. (I read elsewhere that he married in 1857 but I cannot imagine him taking time out from blowing Delhi apart during the Mutiny to marry.) Three years later, he rejoined his regiment in India. The 61st was in Ferozpore when the Mutiny broke out and it was Jones who arranged for British families to be brought to the shelter of the barracks, before leaving for Delhi. During the siege of Delhi, Jones commanded the 3rd infantry brigade and was selected, with four others, to lead the storming parties on 14 September 1857. But then Brigadier General Nicholson insisted on jumping down into the middle of the melee and getting shot in the back – a quick and relatively painless death for a man who believed in inflicting the ‘most excruciating tortures . . . with a perfectly easy conscience’. 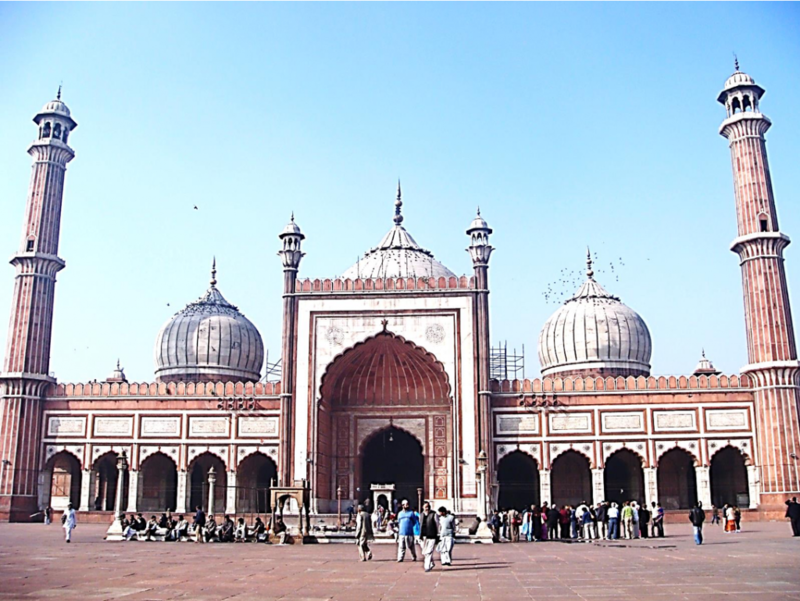 Jones took charge for the next few days of fighting, storming the Lahore and Ajmer gates of the city before bursting into the Jama Masjid – the mosque in the centre of Delhi. Jones was appointed Regimental Colonel of the 32nd (Cornwall) Regiment of Foot in 1871 and remained in the post for the next ten years. The amalgamation of the 32nd and the 46th resulted in the formation of The Duke of Cornwall’s Light Infantry and Jones headed the 1st Battalion of the new regiment. He rose to General and his accolades continued with the awarding of a K.C.B. in 1869 and a G.C.B. in 1886. Jones retired to Ireland and lived in Landsdowne Lodge, on Haig’s Road, Dublin (now Landsdowne Road). General Sir William Jones died on April 8th 1890 and is buried in Mount Jerome Cemetery, Dublin. His wife, Elizabeth Dorothea, had died five years earlier. Landsdowne Lodge still stands at the junction of Shelbourne Road and Lansdowne Road, in more than half an acre of private ground. Perhaps it was constructed by Jones in 1860. The lodge was offered for sale in March 2017 at an asking price of €4, 500,000. It had been in the Baillie-Gage family since 1890. In 2005, Jones’ Indian Mutiny medal and one clasp sold for £2,700 at an auction in London.